Vacation rental apartment. Sleeps 4, 1 bedroom, 1 bathroom. No pets allowed. Pool facing the rear building. #9 is on the ground floor in the back. Pool facing the front building. The office and smaller apartments are there. Roof top for yoga and relaxing. Welcome to Abbey del Sol! One of the quietest and most private apartments at Abbey del Sol. Glass sliding doors open onto your private garden patio. The perfect place to enjoy your morning coffee and meals. Large table with an umbrella and 4 chairs. Two lounge chairs to relax and read. 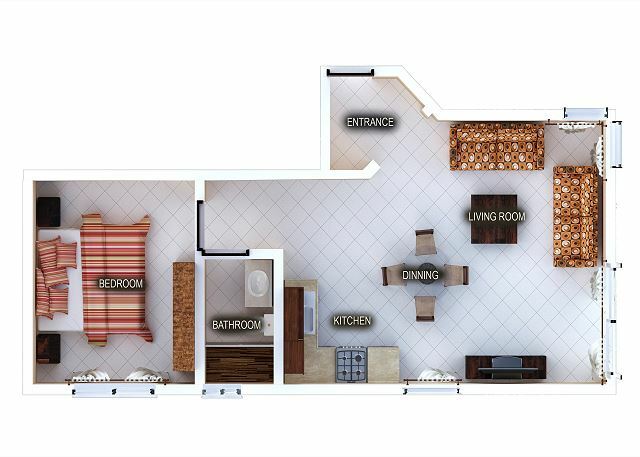 This is one of our larger ground floor apartments; spacious, comfortable and well maintained. New king bed with foam top covered with 500 thread count sheets. Well equipped kitchen with granite counter tops. Free Wi-Fi, bikes and a flat screen TV. Linens supplied. Central office onsite with friendly English-speaking staff to help you with anything you need. Yoga classes on the building's shaded roof in the winter season. 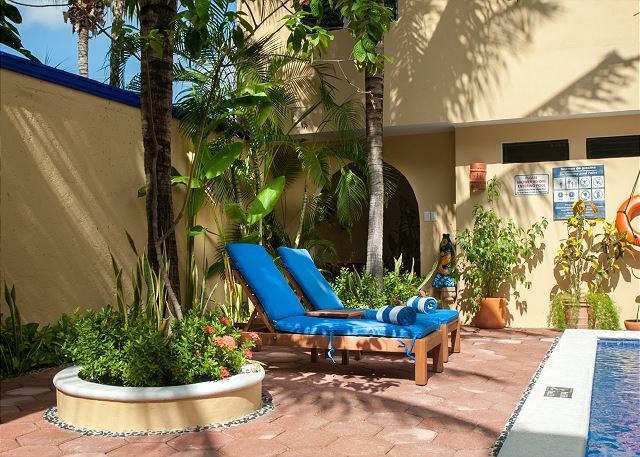 The Abbey del Sol property has 7 comfortable apartments. Rent individually for couples and small families or in combination for groups and large families. Beautiful gardens, refreshing pool. 2 blocks to the beach and 8 blocks to the town square. "Abbey del Sol. Where Travelers find a home!" Rooms Sleeps 4, Base rate for 2 guests. Extra person per night $30 plus tax. Sleeper sofa sleeps 1 adult or 2 children. 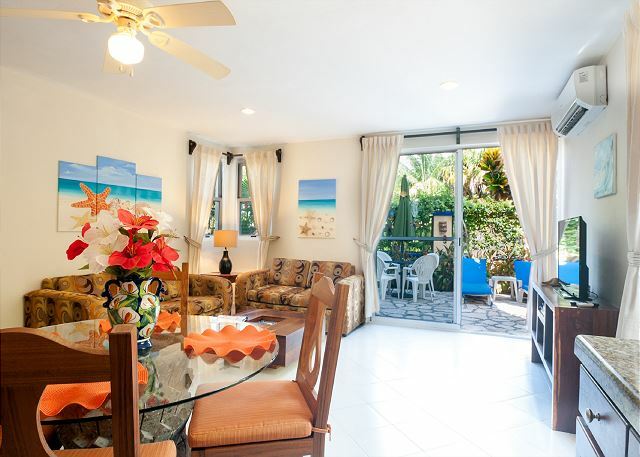 Abbey del Sol is the perfect vacation rental for us. We would never consider an all-inclusive but want to be comfortable. At Abbey we have a meticulously maintained one-bedroom apartment a block and a half from the beach and eight blocks from the town plaza. We've got access to free bikes and a massive library of free videos. Tiff and Abby are warm hosts and they've gathered a staff of friendly, dedicated folks who go out of their way to ensure our comfort. 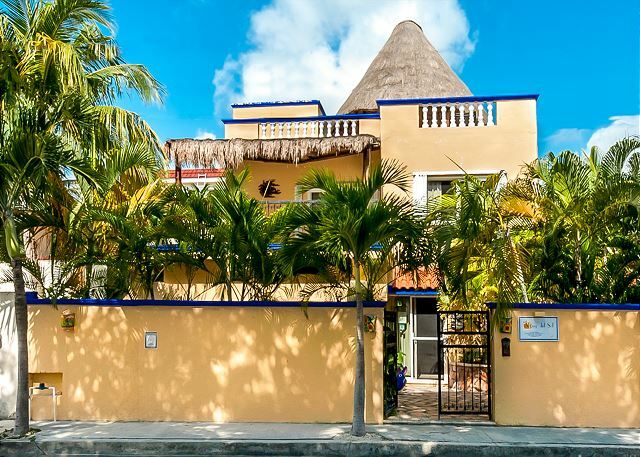 If you like to program your own vacation rather than have it programmed for you, Abbey del Sol might be your perfect spot in Puerto Morelos along the Riviera Maya. We stayed in unit 9 for one week. It was very clean, kitchen and bathroom remodeled, Air conditioning worked well, apartment was fully equipped including beach chairs and bicycles. We loved our private patio with two lounge chairs and table and four chairs. Everything was perfect, super quiet complex and area, friendly and helpful staff. Two short blocks to the beach and a few blocks to my paradise beach club that provided free lounges and umbrella provided you purchased food/drink there. The only negative was that it was a very far walk to the center of town where is the supermarket, majority of restaurants and shops are located. Hola Ede, we appreciate your feedback ! Thank you for staying with us, we hope to have you back in the future. We had a great time. Given our late arrangements for booking this wonderful place, we had two different apartments. First unit was absolutely perfect, with its own private potio. The second one was smaller, but faced the pool. both have lovely bedrooms. we felt very secluded. The staff are exceptional and helped with an emergency medical appointment, arranging taxi and fare. Thanks Mary! Thank you for your feedback, we are glad to be able to help our guest in any way possible. We are happy you enjoyed your stay with us. We hope to see you soon! Friendly and kind staff ready to accommodate and help with whatever is asked. Superior cleanliness and maintenance. Beautiful garden, great pool. Comfortable and relaxing environment. Hola Judy and Bob, Thank you for your feedback, we enjoy taking care of our guest needs in any way possible. We look forward to seeing you next year ! 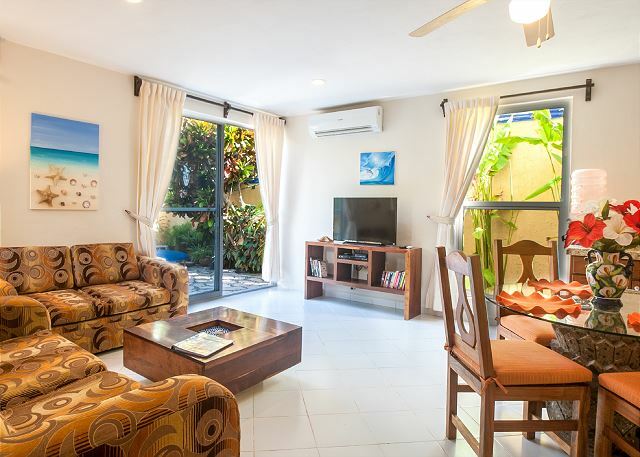 Comfortable apartment ,excellent staff , beautiful gardens, flowers and quite rooftop. Claude and Andree, thank you for choosing to stay with, we appreciate and value your feedback! Hope you had an amazing time in Izamal see you next year ! We had a wonderful 2 weeks at Abbey del Sol. Every detail made such a difference. The well equipped kitchen, the beach bag and towels as well as beach chairs, the beautiful patio was shady and quiet. We especially appreciated the on site staff who anticipated every need and helped with any questions that we had, places to eat, things to do. I highly recommend this little gem. You guys are the best! so, easy going and happy ! Makes us happy you enjoyed the new updates, see you next year! The stay was very nice, the apartment was very comfortable and had everything we needed in it. The property was kept very clean and the staff were extremely friendly. The only bad thing I can mention is the noise level. You can hear everything in the units above. Wonderful place to stay. Staff are kind and helpful. Place is lovely. Staff are kind and helpful. About a block from beach and the pool is also very clean and nice. Nancy the manager helped me arrange the best room to suit my needs. I am very grateful and will be back. Beautiful Mexican cottages. Our family had 3 adjoining rooms. Ours was spacious with the living room opening out into an outdoor lounge area. Well equipped kitchen. 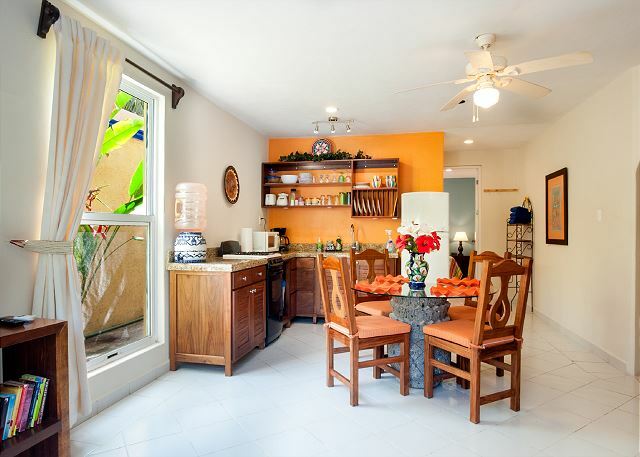 Close to the beach and a nice little walk to the center of town and many eating options. Relaxed, clean, and friendly. 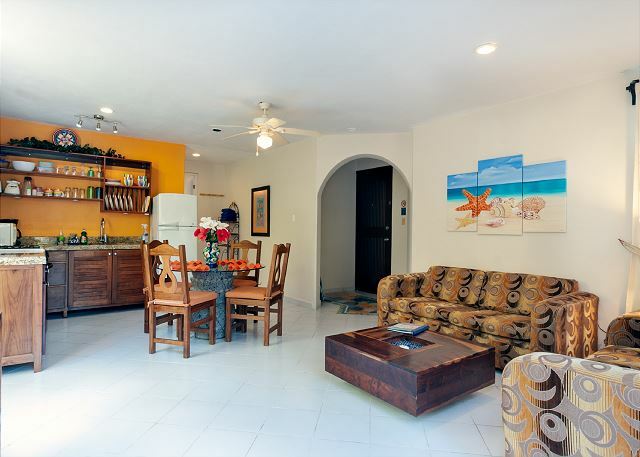 Our favorite apartment with our favorite hosts in our favorite little town on the Riviera Maya. It's the highlight of our spring every year. Once again Abbey Del Sol and the team supplied us with a great place to stay and continued consistent service. Everything about our rental experience is positive. First the excellent staff, all friendly and willing to help. Most spoke excellent English. Our apartment was clean and spacious and the kitchen had all the amenities we needed and more! 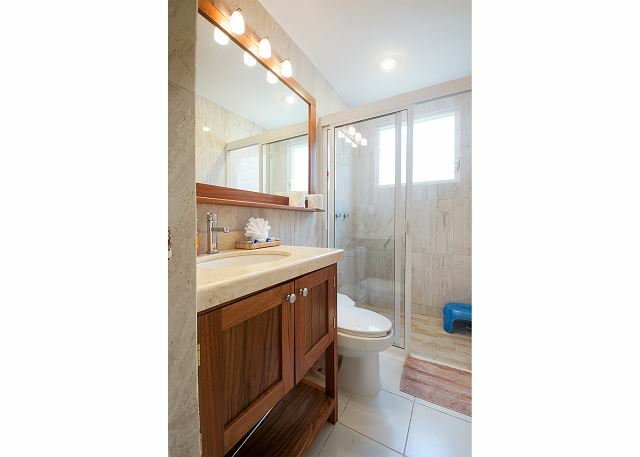 The bedroom was spacious and the bathroom newly remodeled. I can’t say enough about the staff who all bent over backwards to make our stay was perfect. Thank you Abbey del Sol! 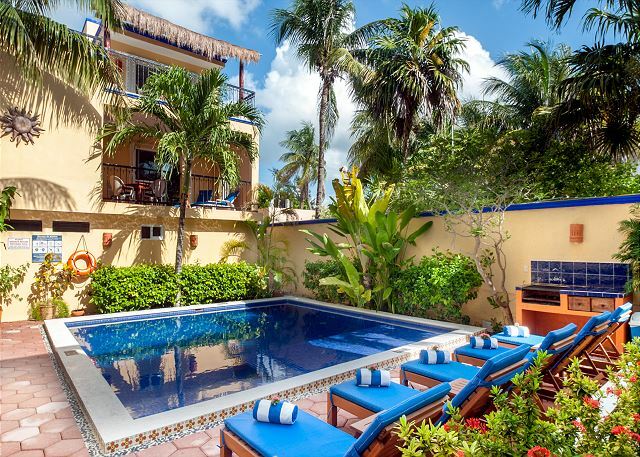 Abbey del Sol is a two-minute walk from Puerto Morelos' endless beaches. The property is beautiful - lush with plants, appealing colour schemes and very well maintained grounds and buildings. They offer many features which are not necessarily always included in other places: bicycles, yoga on the roof, beach chairs, rain umbrellas, a vast video library with the newest movies, etc.. The comfort of their guests really is the first priority for the staff and the owners. We have never had a request that was not attended to very quickly and to the best of everyone's ability. 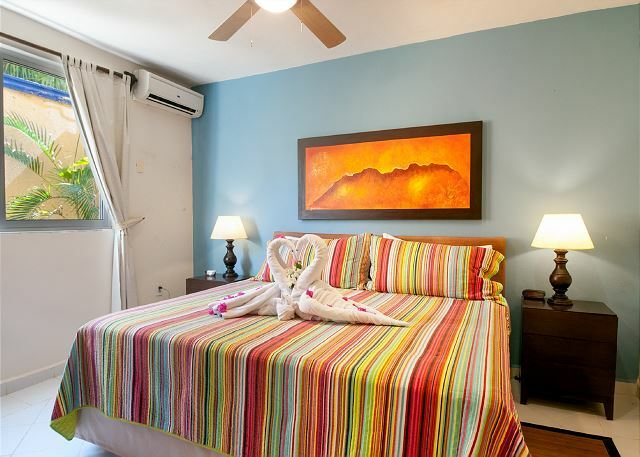 The apartments are not only very comfortable but so attractively furnished and arranged (bright colours, works by local artists.) We do a lot of cooking and found each of the kitchens in the three apartments we have rented over the years to contain high quality pots and pans, decorative dishes and all the necessary small appliances. If something more is needed, they will go and get it for their guests. This year we wanted an extension cord for one of our many electronic gadgets and it was brought to us within minutes! Their attention to detail and willingness to accommodate their guests' wishes are outstanding. The staff is not just efficient but very personable and couldn't be more friendly. In Puerto Morelos we enjoy swimming, walking and cycling. From Abbey del Sol it is an easy walk to the centre of the town. Also, the local bus stops two or three blocks away from the property. There are lots of restaurants nearby and we hear that many are very good but we prefer to buy the fresh local produce and fish and cook ourselves. There are also many stores and artisans' stalls. It is a small, quiet place and suited for family vacations. Most guests at Abbey del Sol are regulars and come again and again. That there are so many of us who don't go anywhere else and book years ahead is the best testimonial for the outstandingness of the place. We have been staying at Abbey del Sol since 2010. Each time we arrive we are welcomed like family. We are always excited to see the changes in the property as there are always renos or improvements to check out. The staff is amazing and really want to make your stay as perfect as possible. We absolutely love this place and after many stays it really is our second home. We enjoyed our stay so much. My kids loved the pool and the staff was friendly and warm to them. The apartment was beautiful, large, clean and well equipped. The staff was super helpful and helped us with all of our many questions. They even did our laundry for us for a small fee and theu got it back yo us in just a few hours. It was a little too far from the town square to walk with the kids, but we borrowed a bike for one of the adults to ride into town and it was a quick and easy ride. I was there on business but Abbey del Sol provided for and insured there was plenty of time for relaxation. Home is quiet and isolated from outside noise and the staff was ready and willing to provide any information if needed. I will return to Abbey del Sol. The difference is in the details. We had a a wonderful stay at Abbey del Sol and what puts it above so many other rentals are the many pleasantries that other places don't have. Our place was clean and roomy, with everything in working order. Soft sheets and towels, a little coffee and sugar in the kitchen, an inviting pool with comfy chairs around it and lovely surroundings. The staff is incredible, always friendly and helpful and willing to help in any way. I had a great time . The staff were all very friendly and very helpful . I have been staying there for a number of years and the place is always clean and well looked after. This is our third stay in an Abbey Del Sol property but our first stay in Abbey Del Sol suite #9. The suite is clean, well appointed and spacious. The courtyard is a pleasant place to sit after a day at the beach. 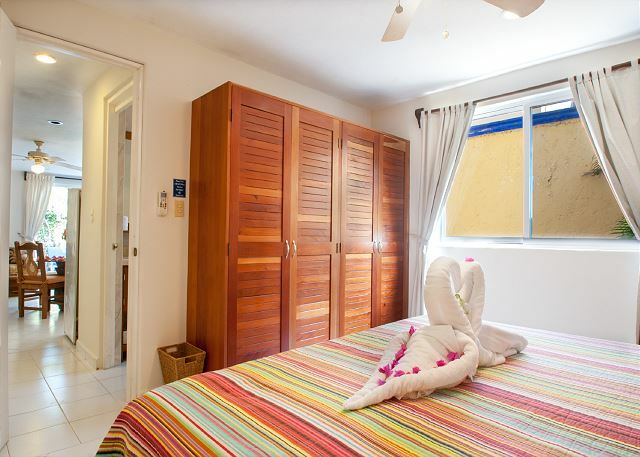 The location is great with a very short walk to the beach and a short walk to the shops and restaurants. Staff are pleasant and helpful. At Abbey del Sol you are always assured of the comforts of home and great assistance from the staff (when needed). We stayed at the Abbey del Sol for 20 nights and found it to be very bright, clean and private. Also very quiet. We had a little problem with the TV, however, it was repaired in a day or so. Anything we asked for or about the staff were always eager to help. The beach club is a about a block away and right on the beautiful Caribbean. There is a charge of $12.00 per use of a palapa so this can get a little pricey if used daily. Loved going for daily walk to the village (15 minute along beach) and well worth it. Would highly recommended the Abbey! We love Abbey del Sol! We were delighted with our apartment, with its private patio and very functional kitchen. It was comfortable in every way. The staff at Abbey is super helpful with whatever questions or needs you may have. Loved having the option of hanging on the patio, sitting around the pool, or walking the two blocks to the beach. Rooftop yoga was great, too. We'll be back! Puerto Morelos, fun in the sun. although I did not find it bothersome at all. The beach clun Unico rents chairs and umbrellas, and provides food and drink while you relax on the beach, nice set up. Great skirt steak and tacos at . craft the jewelry in their own shop. Overall a great vacation stay at Abbey del Sol, quaint, clean and quiet. Puerto Morelos is a wonderful town and one of its best selling points is Abbey Del Sol. Close to the beach, short walk or bike ride to town, friendly and helpful staff and a well-maintained, comfortable property. Couldn't ask for more! The entire rental experience was excellent, from our first inquiry to the time we checked out. Nancy, the property manager, was so friendly and helpful. The apt was comfortable and well-equipped for cooking simple meals. We enjoyed morning coffee and evening cocktails in the courtyard. The complex is a short walk to a beautiful, uncrowded beach. It was about 12 mins to walk to the town square. We borrowed Abbey Del Sol's bikes to explore the area north of the complex. In town, we bought fish from the fishermen's co-op, enjoyed several dinners at restaurants, and took a snorkel trip from Los Pelicanos (highly recommend - our group was only 8 people, with 2 friendly and professional crew members). Puerto Morelos was a great base for day trips to Coba, Tulum, Chichen Itza and Isla Mujeres. We really enjoyed the laid-back feeling of the town. I don't think there's a lot of night life, but we were more interested in day time activities. Overall, a great experience! We stayed for 10 nights in January 2015 at Abbey Del Sol #2 Apt. 9. Two years ago we were at Abbey Del Sol and had enjoyed it so much that we returned this year. We had a different apartment this time and we loved it. Apt. #9 is one of their larger apartments that includes a lovely garden terrace. When not on the beach or in town, we spent our time in this garden. It was delightful. The apartment itself is spacious and quiet. You do not have a view of the pool but you do have the garden that is quite private. We would definitely return to this apartment. The entire property is very nice and the staff are very helpful. We felt at home here. The property is close to the beach. We stayed at ADS from Nov 30 to Dec 14. This was our 10th time staying here and we are booked again for March. We go twice a year and have stayed in many if the units. We keep coming back because it feels like home. The units are all good and the staff are all great, friendly and attentive. Each time we come back we notice improvements in the properties that you don't always see in other properties. Constantly upgrading the properties show that management cares that their guests have the most comfortable stay possible. The town is small and it affords the relaxing vacation we look for. We have been guests at Abbey del Sol for 6 years and each experience has been exceptional. The location, the properties and customer service have earned our loyalty. The rooms are always clean and welcoming. We appreciate all of the services that they offer that are above and beyond anywhere we have stayed. Being picked up at the airport by a friendly familiar face, helping us find a restaurant, offering ideas for day trips or where we can take a yoga class...the service is exceptional. If you want a vacation where you can design your day, cook your meals in or eat out and enjoy beach or pool, this is the place for you! Excellent experience, especially the onsite management. We have been going to Abbey Del Sol for several years and are never dissapointed. We have rented houses and stayed in the apartments and always are provided with a atmosphere of everything is taken care of. Abbey,Tiff,Jin,Freddy always go out of their way to make sure your stay is memorable and your needs are met.We have already booked for next year. We loved our week at Abbey Del Sol, the quiet, lush courtyard with pool, comfortable apartment with private back garden and convenience of beach chairs and bikes. It was a short walk to the beach and a quick and easy ride on bikes to the town center for coffee and a visit to the German Bakery. Pilar and all the management staff were very helpful and accommodating. We prefer vacationing in a real Mexican village while enjoying the comforts of home. Abbey Del Sol allows us to do so. WE stayed in Apt #9 in Del Sol 11. Large and private. The whole facility is top notch. All the staff does a very good job especially Pilar. Once you've stayed with Abbey, Tiff and the gang at Abbey del Sol, you never want to stay anywhere else...their friendliness, helpfulnes, and attention to detail and desire goes unsurpassed! don't let the secret out! As in the past six years, we will be back again.....we do not want to be too enthusiastic about Abbey del Sol and the wonderful village of Puerto Morelos...lest too many people discover this semi hidden gem!!! Abby, Tiff, Pilar, Jin and the rest of the crew are fantastic hosts, and we enjoy their hospitality and knowledge. See you in 2014.....hasta luego! 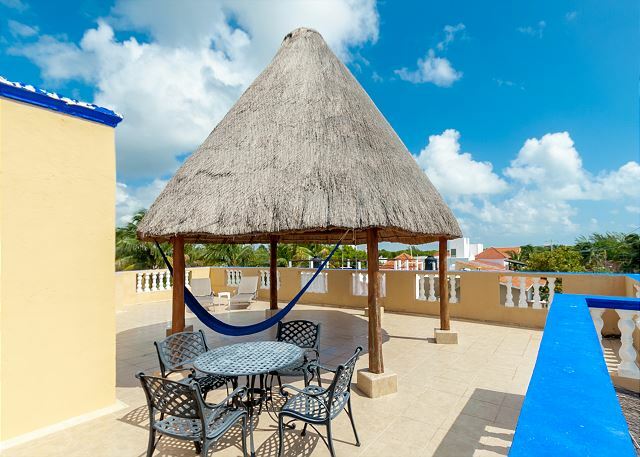 We fell in love with Puerto Morelos and this apartment. We could easily stay here for a very long time and will for sure come back. There was some water problems, but that is almost to be expected in Mexico. Works very well for family with kids who needs the extra space and convenience to the pool area + it has all the equipment you need for a comfortable stay. We will be back! Our stay in Abbey del sol was great! recommend the apartment to families and couples considered a quiet and relaxing place. La nostra vacanza negli appartamenti Abbey del sol è stata grande! la raffinatezza degli ambienti e la cura dei dettagli sono stati veramente eccellenti. consiglio questa struttura soprattutto alle famiglie e alle coppie considerato l'ambiente tranquillo, completo e decisamente rilassante. A lovely property and fabulous people...our wish seemed to be their command!!! we felt at home the moment we arrived! hard to describe how very accomodatig and welcoming these folks is something that one feels and enjoys and is grateful for...we are charmed! Nous avons été très satisfaits de notre séjour chez Abbey del Sol. L’appartement était très propre et le personnel très gentil. Si nous retournons à Puerto Morelos, nous réserverons à nouveau à cet endroit et nous recommanderons les lieux à nos amis. We enjoyed the low key, quiet, small town atmosphere. Abbey del Sol is in a great location. We appreciated the airport pick up and drop off from Jin's transportation (also a grocery store stop). The guests who stay here are friendly to each other. The staff is very helpful and willing to assist you in having the best possible vacation time, whether is it going on sight-seeing excursions or just relaxing on the beach or around the pool. Loved having the access to beach chairs and bicycles.